The clustering problem has been paid lots of attention in various fields of compute science. However, in many applications, the existence of noisy data poses a big challenge for the clustering problem. As one way to deal with clustering problem with noisy data, clustering with penalties has been studied extensively, such as the k-median problem with penalties and the facility location problem with penalties. As far as we know, there is only one approximation algorithm for the k-means problem with penalties with ratio \(25+\epsilon \). All the previous related results for the clustering with penalties problems were based on the techniques of local search, LP-rounding, or primal-dual, which cannot be applied directly to the k-means problem with penalties to get better approximation ratio than \(25+\epsilon \). 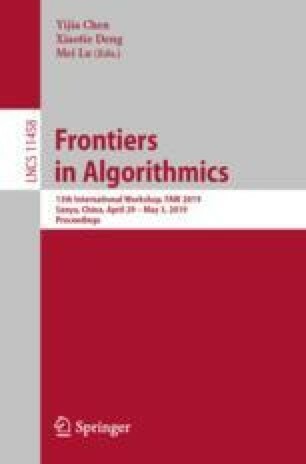 In this paper, we apply primal-dual technique to solve the k-means problem with penalties by a different rounding method, i.e., employing a deterministic rounding algorithm, instead of using the randomized rounding algorithm used in the previous approximation schemes. Based on the above method, an approximation algorithm with ratio \(19.849+\epsilon \) is presented for the k-means problem with penalties. This work is supported by the National Natural Science Foundation of China under Grants (61672536, 61420106009, 61872450, 61828205), Hunan Provincial Science and Technology Program (2018WK4001).